2.Our cushion cover were designed by the real artists, made from extraordinary quality fabrics, with vivid colors and durable. 3.100% customer satisfaction guarantee, if you have any questions, please send email to us, we will reply in 24 hours and give you a solution. 4. All cushions are handmade, so please understand there may be 1-2cm deviation exist. 5.There are slight difference between the picture and the real item caused by light brightness. 6. 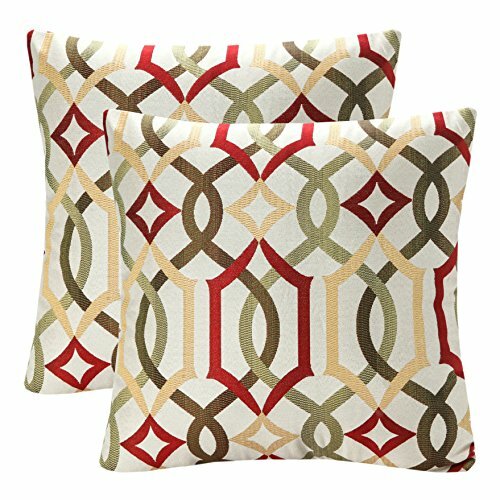 Actual patterns on the throw pillow cover may differ due to pattern placement on original fabric layout. Contain: 2PCS Cushion Cover/Shell, pillow insert are not included. Size: Approx. 18 x 18 inches / 45 cm x 45 cm. Fabric: Made of 100% grade A high quality jacquard fabric. Hidden zipper closure,all edges are sewn with zigzag stitch to prevent fray , safe to machine wash. Suitable decor for home,bedroom,living room and your sofa.